I think I’m a Jesuit at heart. I’ve admired the Jesuits since learning in my Global Church History class about how their approach to missions frequently involved becoming part of the community they were ministering to, learning the language and the philosophy of life and even adopting the dress and cultural habits of the people. Especially admirable were the Jesuits who worked to protect indigenous South Americans from the slave trade (work made famous in the marvelous film The Mission with Jeremy Irons and Robert DeNiro). 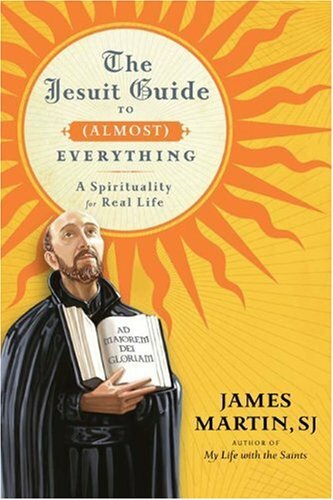 In reading James Martin’s The Jesuit Guide to (Almost) Everything, the latest selection for my church book club, I’ve also fallen in love with the pragmatic Jesuit spirituality that Martin describes. There’s a strain of Christian thought that is drawn to extremes. Instructions to give up all you have or put Christ first are taken to such a literal degree that owning any not obviously necessary item or taking pleasure in any activity that isn’t overtly Christian becomes a source of guilt. It is this strain of thought that pushed me out of my former conservative evangelical world and toward a more moderate version of evangelicalism and eventually into the Episcopal church. I simply couldn’t bring myself to commit to such a way of life for any length of time. I’d try, I’d try very hard, but burnout would quickly ensue. This extreme spirituality is most decidedly not the kind of Christian life that Martin, who is himself a Jesuit priest, embraces. His view is extreme in an entirely different way. Instead of making sure all things in our lives are about God, we are to see God in all things. You see the difference? God is present not just when we take pleasure in the music of Handel but also when we enjoy a great jazz tune or rock out to whatever’s on the radio. We can encounter God’s voice in not just scripture, but also in great (and not so great) literature, even literature that would never get published by a Christian publishing house. In Ignatian spirituality there is nothing that you have to put into a box and hide. Nothing has to be feared. Nothing has to be hidden away. Everything can be opened up before God. In this book, Martin explains how we can see God in every aspect of our lives. He touches on different disciplines, such as the daily examen, a brief reflection on the day, that can help us gain perspective. He also discusses how certain Jesuit commitments, such as those to obedience and yes, celibacy, can be relevant even to those of us who haven’t taken those vows. There’s helpful discussion on how our desires can inform our decision-making and the notion of vocation. In one way or another, Martin touches on virtually every aspect of life. One thing that truly impressed me about this book is how flexible Martin’s version of Ignatian spirituality is. For example, when discussing the examen, Martin explains the five steps as presented by Ignatius and then shares several adaptations that others have made. He then encourages readers to experiment to find what pattern works best for them. In his chapter on different paths people take to God, Martin shows that he clearly understands that not everyone has the same spiritual needs, and he present lots of different examples to illustrate how people live by the ideas he discusses. Through dipping into his own past, telling stories of Jesuits throughout history, and recounting anecdotes from other Christians of his acquaintance, Martin shows the great variety of religious experiences people may have. He even goes so far as to say that many Ignatian practices would be of value to non-Christians (and no doubt many non-Christians practice some variation of the examen or the Ignatian approach to decision-making). I wouldn’t say that I learned a lot that was new in this book. It was more of a book that put into words some of the thoughts I’ve had in the back of my mind for years. I did gain some ideas for habits I’d like to develop and a little push toward pursuing my own spiritual growth more purposefully. There were some times when it seemed a little too self-helpy, and it could have done with some trimming. Although Martin takes some pains to be religiously inclusive, I’m not sure that this book would offer much to someone who isn’t interested in specifically Christian spirituality. I think the best audience for this book would be those who are new to the Christian faith and those who are newly trying to make their faith something more than just church on Sunday, but it can also have value for believers just looking for a refresher. We all need reminders of the things we know sometimes, and that’s what this book was for me. My Catholic family has always been closely aligned with the Jesuits, often referred to as the bad boys of Catholicism. Appreciate the spiritual points you discuss here but have an even greater appreciation for the point about appreciation of literature of all sorts. Points to the intellectual as well as spiritual rigor embraced by the order. Much to like from my point of view. But others would be very willing to detail their weaknesses as well. :) A large and constant debate through their history. The bad boys of Catholicism–I love it! And given some of the things Martin says in this book, I can see why. And yes, I’m sure that as much as there is to admire about the order, they’ve made their fair share of missteps over the years. I really want to read his book about his work as spiritual advisor to the original production of The Last Days of Judas Iscariot. And yeah, the RC position on women is one of (several) big things that keeps me Protestant. Martin doesn’t get into that at all in this book, but he does talk about several different women who take a Jesuit approach to spirituality. Sounds like a very interesting book. The Jesuits played a significant (not always positive) role in early Canadian history so I remember studying them a lot in school. I’m quite anti-missionary though so while the Jesuits themselves hold no appeal for me I do think it would be fascinating to learn more about the views held by those currently in the order. We didn’t talk at all in my class about the Jesuit history in Canada, nor does Martin in this book, but I’m sure they’ve made some mistakes in their long history. As missionary models go, theirs has been one of the better one, I think, especially when it comes to respecting others’ cultures while sharing their own beliefs. What a fantastic approach to spirituality! It is! Very much the way I want to live. I have also learned quite a bit about the Jesuit approach specifically to education this year, and I’m also impressed. This sounds like an interesting book. Martin talks a little about the Jesuit tradition in education, and it is amazing. I’ve seen enough anti-intellectualism in the church that it’s nice to see the intellect being embraced. I know bits and pieces about the Jesuits, and have a vaguely positive feeling about their approach to spirituality. This sounds like a book to look at, though I suspect it might be like your experience – where it is voicing thoughts I’ve already had. I don’t think it’s always a bad thing to be told things we already now–but in a new way. For me, it can be a nice kick in the behind. I love The Mission! Have you read The Sparrow? Yes, yes, I know it’s a novel about finding a planet with beings and traveling to meet them and sounds like wacko sci fi, but it’s about JESUITS going out to meet the new creatures (just as they did back in the 1400s and 1500s in the exploration of the Americas, and so on.) Anyway, I learned a bit about Jesuits while reading it, and many of the major characters are Jesuits. Yes, I love The Sparrow. An amazing book! My other favorite book about Jesuits is Silence by Shusaku Endo, which I’m just getting ready to reread. I love the Jesuits. When the Catholics at my university church were mean to me during the confirmation process, my aunt hooked me up with a really sweet Jesuit priest to confirm me instead. He told me all about how when he was in seminary, there were a bunch of women in the seminary too because everyone was so sure they were just about to let women become priests. I thought that was really, really sad. What a wonderful personal story! And what a sad story about those seminarian women–how awful for them. Thanks for reviewing this book. It looks quite interesting and might have to put it on my TBR. Thanks for the tip. I’m interested in learning more about the Jesuits, so it’s good to have a idea of a book to try. I am a Seventh day Adventist. I therefore have the Bible and the Bible only as a guide for truth. I am not sure if truth is of greets value in the Ignatian Spirituality of the Jesuits. It seems more pragmatic: Does it work…can I benefit from it?, seem to be the question. To me the thought of “seeing God in all things”, becomes a way to “create God in your own image” instead of letting God transforming you to the likeness go His image. Sinful acts, desires and pleasures can easily be seen as acceptable to God, because “God is in all things”. That is not compatible whit the teachings of the Bible. I would like to know what kind of conservative church you were a member of before. It could have been Seventh Day Adventist… Is it? False holiness and legalism among different groups in the conservative part of many churches leads to kind of fanatism. But this is the weakness of the human mind. It is not necessarily a fault on the teachings. Good and truthfull teaching is often corrupted by people who have not been converted and therefor either become fanatics (legalists) or liberals (everything is acceptable to God). Just look at the jews before Christ came. The jewish pharisees had the truth, but the became fanatics and made their own laws as if they were Gods laws. They made it impossible to serve God. It is dangerous to leave solid biblical foundation ad the jesuits have done in their mystical experiences which they take for proof of contact with God. I believe we are coming very close to a time similar to the time before the reformation. And I believe the jesuit order will be the tool to open of for the flood gates of hatred against true biblical christianity as it was opened ind those days when the both the Bible and people who believed in it were burned. Remember that the Jesuit were the storm troops of the Catholic Church to counter attach the protestant reformation. This is still their goal. And they use a “user friendly” edition of the mystic “Spiritual Exercises” to attract secular as well as religious people to transform them in to the image of Catholic Chuch. And I believe that this church is still the enemy of the Bible and the enemy of truth. “….and the time is coming when those who kill you will think they are doing a holy service for God. This is because they have never known the Father or me.